Kat and Ana as seen in WarioWare Gold. 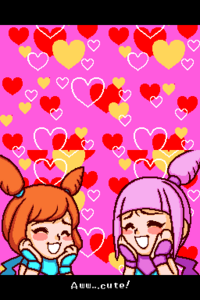 —Kat and Ana, WarioWare: Touched! Kat and Ana are major human characters in the WarioWare series. They are ninja twin sisters who adore nature, especially animals and flowers. Their house is located in a park in Diamond City. They attend both the Diamond Kindergarten and the Mystical Ninja Elementary. Their names are a pun on the word "katana", a type of Japanese samurai sword. Kat and Ana debut in WarioWare, Inc.: Mega Microgame$! as two of Wario's friends who help him produce microgames. 1.2.1 WarioWare, Inc.: Mega Microgame$! 1.2.2 WarioWare, Inc.: Mega Party Game$! 3.2 Profile Information from WarioWare, Inc.: Mega Party Game$! 3.3 Website Bio from WarioWare: Touched! Kat and Ana share information about themselves and their family in their diary at the official WarioWare, Inc.: Mega Microgame$ Japanese website. They come from a family of ninjas, named Iga Clan, which greatly inspires them to practice ninjutsu since childhood and become ninjas themselves when they grow up. Kat and Ana's father left his parents' house when he was a kindergartner to seclude himself in the mountains and develop his self-discipline. Kat and Ana planned to do the same, but abandoned the idea after playing a game of living by themselves for a while. However, Kat still expresses her resolve to go through this training. Kat and Ana are introduced in the opening cutscene of WarioWare, Inc.: Mega Microgame$!, in which Wario invites them and other friends of his to join his company WarioWare, Inc. as game developers. The evil spirit Boneheads has possessed the prince/princess and also caught Ana. In Kat and Ana's story, a villainous skeleton spirit named Boneheads appears over the Castle in Diamond City at night. He takes possession of the princess/prince who sleeps under the roof. Ana appears along with her crew consisting of five other ninjas. They attack the spirit, but he easily defeats all of them with his two lengthy swords. Only she can still affect something, but she fails as well. Because Ana hasn't a chance against Boneheads, she assigns her animal companion, Don the Sparrow to carry a letter with the message "Ninja girl! Save me!" to her sister Kat to call for help. After he flies off, Boneheads also captures Ana who is captivated with a rope. Kat resides with Paw the Dog at an unknown place in which seems to be far away from Diamond City. When Don the Sparrow arrives, he drops the letter in front of her. Shortly after, Kat reads the message and heads for Diamond City with her faithful canine companion. On their way, they came across various Japanese landscapes. Kat and Ana's quest is over. When Kat and Paw the Dog arrive, they already face Boneheads at the entrance of the Castle who floats up to the roof again. Kat and Paw the Dog make it through the many floors of the Castle and eventually reach the roof where Boneheads awaits them. Kat battles him, but she couldn't vanquish him with her casual sword, so Paw the Dog joins the fight and morphs into a gargantuan blade. With the help of Paw, Kat can finally defeat Boneheads after some effective slices. He degrades bone by bone. The princess/prince is delivered from Boneheads' influence and Kat rescues Ana by cutting the rope with that she is captivated. At the end of the adventure, Kat, Ana, and their two animal partners along with the princess/prince being gleeful can be seen in front of the Castle. Kat & Ana's microgames are themed after nature, and thus all of them feature animals or plant life in some way. The song Four Seasons plays throughout their stage. In an unlockable minigame called Jump Forever, Kat and Ana swing the rope that Wario has to jump. In the unlockable minigame taken from Mario Paint, Fly Swatter, the Bob-omb appearing in the congratulations sequence has been replaced by Kat. In WarioWare, Inc.: Mega Party Game$!, Kat and Ana perform in a television show called Super Show after 9-Volt's entrance. Under the headline "Karate", they show off their ninja techniques. However, it isn't known what occurs next because Wario's television set bursts. Kat and Ana are two of the ten selectable characters in the multiplayer games. In WarioWare: Twisted!, Kat and Ana go on a field trip with their kindergarten class on the Diamond Knoll. Their pets, Shadow the Dog and Shuriken the Falcon come along with Kat and Ana. The teacher instructs the children not to bunk. During the trip, Ana discovers a beautiful flower. While Kat takes a stroll, she and her two animal friends pause at the flower. Ana decides to show the flower to Kat and chases after her. However, Kat damages a beehive with a stick when she arrives. The bees get furious for have being disturbed, so Kat and Ana sprint away from the swarm. They abscond into a wooden cabin and rest there for a moment. However, Kat and Ana aren't alone. They encounter the Diamond Troll. He immediately prepares his attack, so Kat and Ana quickly change to their ninja uniforms and attack him with their swords. Then, Kat and Ana charge their blades and shoot out a sword beam at the Diamond Troll. Shortly before they can attack, Shadow the Dog and Shuriken the Falcon crash right into the cabin and hit the ceiling. Then, they plummet into the Diamond Troll and all three are knocked out. Kat and Ana are speechless for a moment. Following these events, Kat and Ana decide to return back home, but after they open the door of the cabin, the swarm of bees reappear. The two ninja sisters and their animal pals escape from the swarm in front of the sunset. In Wario-Man's story, the alien Orbulon gives Kat, Ana, Mona, 9-Volt, and 18-Volt a flight in his spaceship. All five humans sit on seats behind Orbulon. Kat and Ana remark on the monkey after they find it stealing their bananas. Ana and Shadow the Dog stay in their house in WarioWare: Touched!. She wants to eat bananas, so she opens the door to the room where the bananas should lie on a dish. However, Ana only finds out that the fruit is missing. Shocked by this, she hectically searches the fruits in every corner of the room. During this, Shadow the Dog notices animal footprints in the house. He informs Ana of the tracks by barking. She now also notices the tracks and sets off to find the banana thief. Before heading out, Ana writes a note for Kat so that she can know where to find her. Ana and Shadow the Dog dash out the door to chase after the culprit. Kat reads the note and catches up to her to retrieve the stolen bananas with Shuriken the Falcon. Kat and Ana eventually capture the thief, who turns out to be a small monkey. They are initially angered, but the monkey quickly endears them, and they give him the name Numchuck. Kat and Ana cheerfully lift the monkey up and down and the thievery is quickly forgotten. Kat and Ana come to the Diamond Dojo's rescue. In WarioWare: Smooth Moves, the gargantuan, red Elephant Ogre comes to Diamond Dojo and stands in front of it at night. The concerned Sensei in the Dojo faces the monstrous being who suddenly lets out a piercing shriek. Quickly, Kat and Ana come to the Dojo's rescue. Ana gets inside the Dojo to reach the Sensei. When she arrives, she notices the Little Ogre bugging the Sensei and yanking his hair. Outside, Kat battles face to face with the Elephant Ogre. She activates her clone powers and five duplicates appear simultaneously, in which the clones immediately attack the giant with their swords. The Elephant Ogre's club and Kat's sword press each other, but then the Little Ogre shouts to stop the fight. The Elephant Ogre leaves with the assumed Little Ogre on his hand. It turns out that the Elephant Ogre has just been searching for the Little Ogre, probably his child. With the Little Ogre on his hand, the Elephant Ogre peaceably leaves during the sunrise. Kat waves to say goodbye, but she suddenly notices that the actual Little Ogre is still there. The silhouette on the Elephant Ogre's hand is actually Ana. She desperately waves with her arms and cries. Kat and Ana also work as editors of Wario's one-shot newspaper, "The Weekly Wario". They write about rumors involving the Form Baton. In WarioWare: Snapped!, Kat and Ana run the newly opened Wario Park along with Wario, Mona, and Jimmy T.. All of their microgames in this game require two players. This section is a stub. You can help the Super Mario Wiki by expanding it. Kat and Ana soaring through the sky. In WarioWare: D.I.Y. Showcase, Kat and Ana have their very own stage called "Kat and Ana's Sky Patrol". In this stage, they jump off a cliff first only to fly above the sky using yellow capes in a fashion similar to Cape Mario and Cape Luigi. They are accompanied by birds (to denote the player's four "chances" for the stage). The twin ninjas are having fun with home-made patchwork. Kat and Ana appear in Game & Wario, where they host the Patchwork minigame. Kat also appears as depicted on a bowling pin in the Bowling minigame with the other characters. Kat and Ana hugging about their eating challenge. Kat and Ana first appear in WarioWare Gold accepting Wario's offer to make games for him for the Wario Bowl, in which they host the second stage of the Touch League with a That's Life theme. In their own story, the twins arrive at Diamond City Castle to find their teacher for a ninja test in hopes of getting their ninja learners permits. They encounter Ms. Munchly who they believe to be their teacher, who tells them that their test is to eat everything she dishes out to them, much to the twin's excitement. After eating numerous amounts of sushi, it is revealed that they completed the Gourmet Master test; their ninja test was right next door and their real teacher, Ninja Steve, was in the bathroom during their feast. Though full from eating, Kat and Ana join Steve to complete their real test. They are later seen dancing at Club Joe with Jimmy, Mona, Dr. Crygor, Mike, Penny, Young Cricket, Master Mantis, and Fronk. They bring a large amount of food that attracts several costumers to the club. At the end of the story, Kat and Ana are among the group who demand their part of the money Wario made from the Wario Bowl. After Wario accidentally lets the briefcase with the tournament money fall off from his hands, Kat becomes disappointed to find out that the money Wario had with him was actually very little, with Ana deducing that Wario had probably spent most of it beforehand. They later gladly split the rest of the money with their friends. The pair as seen in Super Smash Bros. Brawl. In Super Smash Bros. Brawl, Kat and Ana appear as Stickers and together on a trophy. In addition, they appear as Assist Trophy characters that soar across the stage and slash players with their swords, and this is their first 3D appearance. Kat & Ana return as an Assist Trophy in Super Smash Bros. for Nintendo 3DS / Wii U. Their models have been updated to reflect the pair's Game & Wario design. The duo's appearance in the Wario... Where? set. Kat & Ana make an appearance in the Wario... Where? challenge set of Rhythm Heaven Megamix. The ninja twins appear in the set's version of Catchy Tune 2, with the player controlling them as they catch oranges and pineapples bouncing down some steps towards them. Kat and Ana are often depicted of possessing surprising abilities; they've been seen cloning themselves, jumping higher than the average human can, and defeating enemies more than twice their size when working as a team. Many of these powers are classic ninja techniques. Despite this, Kat and Ana are also displayed as quite naïve. While Kat is usually portrayed as being more focused and mature, in WarioWare: Twisted! she disturbs a nest of bees without thinking things through. Kat acts bossy which sometimes results in making Ana cry, but she cares deeply for her. Ana is quieter and more cautious than her sister. Kat and Ana are said to love especially animals and flowers, respectively. The sisters are good friends with 9-Volt, as revealed in their diary. It is unknown how they became friends with Wario. Kat and Ana come with their own set of microgames in all games of the WarioWare series. In WarioWare, Inc.: Mega Microgame$!, Kat and Ana created microgames of the Nature genre. All games involve animals or plants. WarioWare, Inc.: Mega Party Game$! also features Kat and Ana's nature microgames, plus a multiplayer game made by them, Wobbly Bobbly, which involves animals as well, namely tortoises. In WarioWare: Twisted!, Kat and Ana's microgames involve a particular style of gameplay rather than a specific visual theme. In this game, their set of microgames is called Tap Out and requires to press only . In WarioWare: Touched!, the name of Kat and Ana's set of microgames is Ninja Scribble and involves scribbling and drawing with . In WarioWare: Smooth Moves, Kat and Ana's set of microgames involves the forms The Remote Control, The Sketch Artist, The Chauffeur, and The Samurai. Kat and Ana's five microgames in WarioWare: Snapped! require two players to play rather than one. After the end of their stage, photo's of the two players with goofy decorations are shown. In Jimmy T.'s stage, a comic strip of them can be shown. In this comic, they have a fighting practice. In WarioWare: D.I.Y. Showcase, Kat and Ana return to their original role and host a new set of Nature themed microgames again. Unlike the original WarioWare which featured microgames about animals and flowers, the microgames in this set for the game are limited to only animals. In WarioWare Gold, Kat and Ana host the second stage of the Touch League, of the That's Life genre, which includes regular day-to-day activities. All their microgames involve the use of Touchscreen Controls. Profile Information from WarioWare, Inc.: Mega Party Game$! Bio: Descendent of the Iga ninja clan, Kat is the oldest of twin sisters. She goes to Diamond Kindergarten. Kat is bossy and a bit of a bully, but she loves her pet turtles. Bio: Kat's younger sister, Ana, is very quiet. Kat sometimes makes Ana cry, but Kat is always there when Ana is in danger. Ana loves all living things, especially flowers. Website Bio from WarioWare: Touched! They're ninjas, yes, but also kindergartners. So it's no surprise that playtime for this katana-wielding, puppy-loving duo involves lots and lots of scribbling. Just try to stay inside the lines. Rank C – Kat is a ninja who's still in nursery school. Though Ana's twin, Kat is a little older and full of energy. Rank B – Kat is fairly rough-and-tumble on the playground. She never misses a game of tag. No one can catch her! Rank A – Kat is skilled in katana techniques and those for shuriken too. Bad guys don't stand a chance against her. Rank C – Ana is a ninja who's still in nursery school. Though Kat's twin, Ana is a bit younger and very watchful. Rank B – Ana likes to play with animals at school. Some like Ana so much, they follow her all the way home. Rank A – Ana is very skilled in the techniques of transformation. She can even make herself look like a flower. Twin female ninjas who attend Diamond City Kindergarten. Kat, the older of the two, has pink hair, while the younger Ana has orange hair. Both of the girls are still very young, but they're also very respectful and address their superiors as budding ninjas should. Kat and Ana have a soft spot for living things. Kat loves cats, and Ana is attracted to flowers. DS WarioWare: Touched! (02/2005) These ninja twin sisters of the Iga Clan attend Diamond City Kindergarten. The high-tech katanas they carry, made by Dr. Crygor, are like an extension of their own bodies. They strike at incredible speed with devastating attacks. By the way, Kat is the one with pink hair. Telling these twin sisters apart is easy: Kat's hair is pink; Ana's is orange. They both go to Diamond City Kindergarten, love nature, and train as ninjas with the Iga clan. In this game, they deliver an impressive joint cross-slash attack with the gigantic high-tech swords Dr. Crygor made them. For this subject's image gallery, see Gallery:Kat and Ana. The music in Kat and Ana's epilogue in WarioWare, Inc.: Mega Microgame$! is the same as during the level select in the Golden Pyramid in Wario Land 4. The girl appearing in Rhythm Heaven Fever's game "Kung Fu Ball" bears a resemblance to Ana while the boy bears a resemblance to Young Cricket. ↑ 3.0 3.1 Kat and Ana's diary at the official Japanese WarioWare, Inc.: Mega Microgame$! website. nintendo.co.jp. Retrieved April 3, 2018. ↑ Nintendo. さわるメイドインワリオ. nintendo.co.jp. Retrieved December 6, 2016. ↑ NintendoRU. (December 06, 2018). WarioWare Gold — трейлер Кэт и Аны (Nintendo 3DS). Retrieved December 06, 2018. ↑ Nintendo. 만져라 메이드 인 와리오. nintendo.co.kr. Retrieved December 6, 2016. ↑ iQue. 摸摸瓦力欧制造. "卡特和安娜 -- 她们是忍者，但同时也是幼儿园小朋友。所以，当你发现她们的游戏里有那么多乱涂乱画时，千万不要惊奇啊！只要尽力保持在线内就可以了。" ("Kat and Ana -- They are ninjas, but are kindergarteners as well. Therefore, don't be surprised when you find so many scribbles in their game! Just try to keep in lines and you'll be ok.") Retrieved December 3, 2016. Pyoro • Super Pyoro • Mewtroid • Mewtroid 2: Return of Sameow • Micro Golf Open • Micro Golf Tour • Pro Bowl • Autograph! • Game & Watch: Manhole • Pumpkin Panic • Memory Match • Root Awakening • Sew Tricky • Foiled! This page was last edited on April 19, 2019, at 15:01.